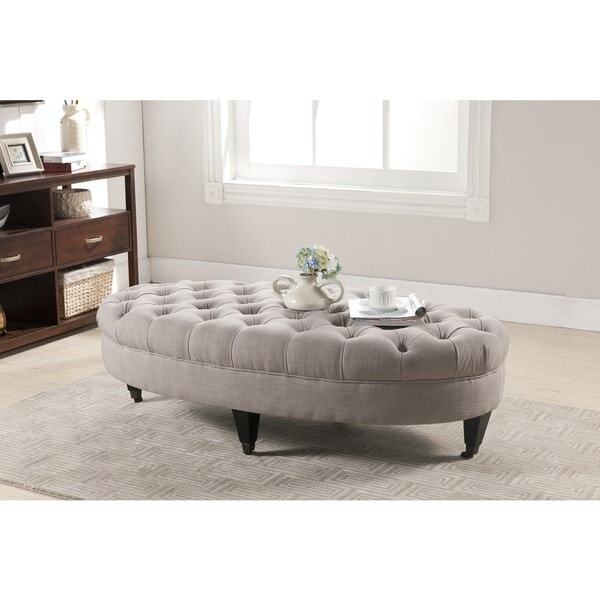 An elegant addition to any home, this ottoman is as comfortable as it is useful. Perfect for resting your legs after a busy day or for sitting down for a cup of coffee with an old friend, the ottoman is available in neutral beige or grey fabric options, so customizing it to your design scheme is a breeze. This ottoman is absolutely gorgeous and exactly as pictured on website. It is beige not gray but I would call it more of a taupe colour. From previous reviews I was hesitant on ordering because of the colour but its perfect! It goes great with any colour as it is a beautiful neutral colour. I was looking for a bigger oval ottoman to place between my two sofas and it looks stunning! Don't know how durable it would be for sitting on it but I am using it to prop our feet up and as a cocktail table. It looks great with a serving tray on top. Very well made and would cost at least triple the amount in Furniture Stores. The rolling feet on bottom are a great feature to have which make it easy to move around. I did have a problem with the condition when I received it (nothing major) but Customer Service at Overstock was very good to resolve the situation. Cannot express how much I love this ottoman!!! This is NOT beige!! It is light grey. I put it in the studio to match the beige furniture - not even close to beige. Pretty but not as pictured. Great piece for the look but not regular use. This ottoman has a great aesthetic however it's not constructed well enough for an area that receives regular abuse. It's a show piece in our living room and does support a large tray holding several heavy decorative objects, however you wouldn't want to use it in a family room with kids and dogs to regularly abuse it. The legs are black-brown and wood soft so they mar easily, be careful with them. The fabric is more of a putty gray-brown and not the beige shown in the image. Overall it's great looking and worth the price if you can get it with a 10%/ 15%/ 20% off coupon. This is only my second furniture purchase online so I was skeptical. The ottoman is exactly as described. The foam is firm so it can be used as additional seating or to put a serving tray on. The color was just as it appears in the picture. Good Product. Would definitely recommend. This ottoman is everything you're dreaming of and more. I ordered the beige color and it's beautiful. It's Large which makes it look rich. Our sofa is a full 100" wide and this looks perfect infront of it. The wheels allow you to move it to vacuum etc. I was debating between the beige and the grey. I'd glad I got the beige, it was cheaper and is just as sophisticated and couture as the grey would have been. I highly recommend this to anyone with a large sofa looking for something without hard corners. Score another home run for Overstock (no, I'm not a paid spokesperson. I'm an actual customer). The beige ottoman arrived in pristine condition even though the packaging box was beat all to heck. Nothing about the ottoman is disappointing. It is a exemplary piece of furniture. Quality is built into every detail. The button tufting is alluring & firm. Assembly was as simple as screwing on the legs. Get it while you can. It is well worth the investment. Absolutely love it. But it's grey! It's beautiful!!! But yes it's more grey. No major assembly required just screw in the legs. It's oval in shape and it's a good size. Almost A size of a love seat. Was very surprised at the quality!!! You can see the metal buttons through the fabric but not enough to draw attention to it. I LOVE MY OTTOMAN!! The charcoal gray is more of a navy gray than a warm gray. Still beautiful but have to use in a different room to match better. Client wanted a neutral ottoman and I wanted an oval shape for the space. We also needed it to be on casters to be able to easily move it from one side of the space to another. Looks very expensive and works great. Color is more a grayish oatmeal. I bought this for my daughter's apartment. It is well made. The size and neutral color make it a versatile piece. There is room to put a tray on it for drinks as well as put your feet up. This fits my needs perfectly. The slate grey shade coordinates with the balance of my living room design. Only complaint is if you sit on it in the wrong place you may tip over. The ottoman could have used 4 more legs. Love, love my ottoman. I was specifically looking for oval shape which is not easy to find. This goes perfectly in my modern living room and the rounded corners make it easy to navigate around. Nice to be able to put feet up or tray on top for drinks, etc. It is very light so not good if you have kids sitting/jumping on it, but fine for me. Quality ottoman, sturdy and nice gray color. Works well as both an ottoman and coffee table when you play a tray on it. After a while the upholstery starts to pill, otherwise love it! I have this in my guest bedroom.....everyone loves it & so do I.
I love this piece but it’s not as sturdy as I would like, it tends to tilt. Not sure if it’s the casters or maybe they should have weighed it more on the inside before covering with fabric. Otherwise, it’s one of my favorite pieces! Perhaps the ottoman we received was just a lemon, but the legs were uneven and the casters constantly bounced up and down loudly every time someone touched it. Returned it. Absolutely perfect for our space. Love the quality, material &amp; design. I do wish the feet were Spaced differently for better stability, but it’s not really a deal breaker. Love shape, size, but color is not true. It reads grey in person instead of beige. "can i take the wheels off??" You should be able to. There are 3 small screws attaching the metal wheels to the wood legs. I don't know if there would still be a flat surface on the bottom of the legs, but imagine so (I didn't actually remove my wheels to answer this question). Taking them off will lower the ottoman about 3". "what is the dimension of this round cocktail ottoman? It is not listed correctly in the dimensions?" "can a swatch of the fabrics be ordered? thank you"
Hello brooke2007, a swatch of fabric is unavailable for the Baxton Studio Brighton Linen Modern Tufted Ottoman. We are sorry. Have a great day. "Hi! Are the wheels removable?" Hello leesa, yes, the wheels should be removable. Thank you for shopping with us. It has a unique oval shape I can't find in stores. It was different from other ottomans. I like the proportions and it is understated. quality appears to be there from picture and description although in general i find the descriptions of furniture on Overstock to be lacking. The foam density should always be included and if there are or are not sinous spring support in addition to double down joints, etc. The colors of products OFTEN are WRONG which can be very frustrating when you are trying to match pieces. "Can the wheels be locked so it does not move around? Is beige available at this time? Thank you"
Hello, tamaralori. The wheels do not have locks, and the grey linen finish is the only option we have available at the moment. Thank you for your inquiry, and have a great day! "Hi, Is the grey currently in stock?"